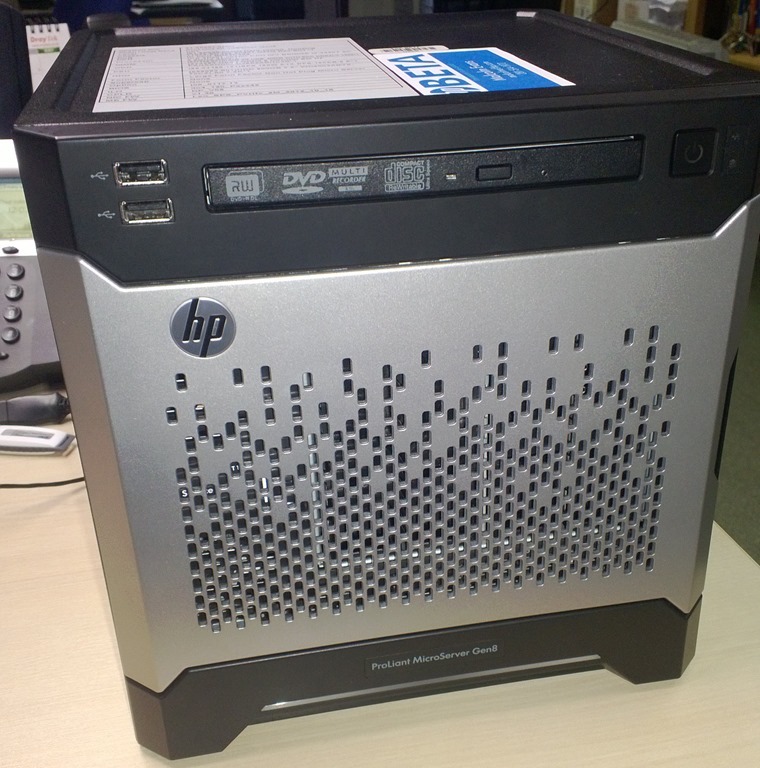 What can i say about the HP MicroServer, if you haven’t heard of it then I’m not entirely sure what you have been doing since HP released their first version way back in 2010. 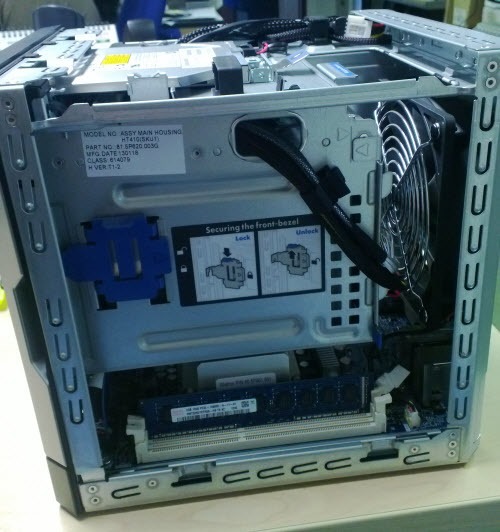 Championed by most of the SMB IT Community (I’m yet to meet someone who doesn’t like it) it offered a fantastic set of features for a very, very competitive price and because of that was the ideal box for a whole host of scenarios. From providing Client Backup Services to the computers in an office, to being put in a cupboard underneath my TV the MicroServer has proved to be very versatile. Mine has an HDMI Video Card in it, and we use it as a media PC to watch netflix etc on. I know Tim Barrett has so many MicroServers in his house, he has actually built a new room out of them. The box itself did have some drawbacks though, not least in the design of the chassis. Whilst it was cool it was so small, did you ever try to get to the RAM? Trying to prise off that RAID Controller cable to remove the motherboard was a total PITA. With HPs new Gen8 MicroServer they have tried to address some of those problems. 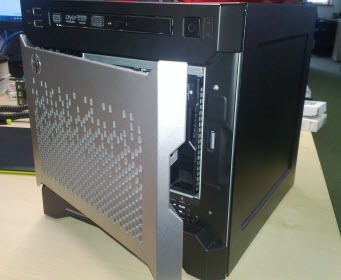 I am not going to concentrate much on the specs, but on the features that i particularly like on this new MicroServer. Firstly – a Magnetic door clasp. Oh yes, i said magnetic. Try and slam the door shut – a little magnet just inside the case pulls that door closed with a satisfying click. Also gone is the key lock, replaced instead with a bezel lock inside the cover. 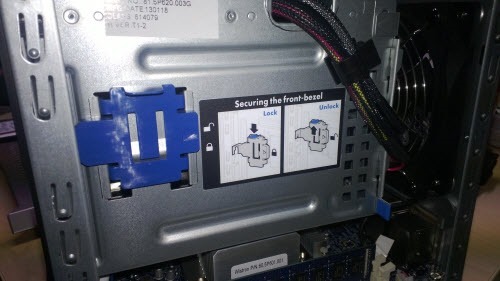 How about access to the RAM? well the chassis now has a lift off cover rather than a slide off lid. This allows for much easier access to the internal components than before. 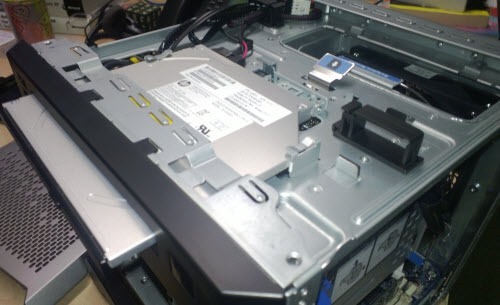 The addition of a slimline DVD Drive is also a nice touch i think, as with the old model an additional 5¼” Optical drive was required. The beta units we tested have slightly different spec than the finished article. The tech specs are available via the HP site below, here is a little taster.. Maximum Memory for the new MicroServer is 16gb. UEFI is not supported on the Gen8 MicroServer. I made two short (and terrible) videos demonstrating the differences on how you might approach taking the two different MicroServers apart. Obviously me being me, i am looking at Essentials 2012 as the target market for this device, it certainly would do the trick for an office currently running SBS 2003 moving email to the cloud and just requiring on premises storage and Active Directory. If the Gen8 MicroServer retains a similar price to the previous models i think it could prove to be a very popular little server indeed! Can you please check if S3 mode is supported? Have you tested if it supports 4 TB SATA drives? Officially HP says 4 x 3 TB in their documentation and ConfigureAider but obviously 4 x 4 would give better capacity. Afaik, it is a max of 12TB internal Storage accross 4 3TB drives. You may also need to know that the MicroServer does not support uEFI. Just posting the link to the quick specs in case anyone else needs it. Just like with the old Gen MicroServer (N40 etc) accepting 16GB of ram, you may find a 4TB drive works in the Gen8 server, but it would be at your own risk and non supported etc etc.